Last month we kicked off our monthly series of regular, bite-size, data-focused updates for Meta. Thanks to all who contributed to the discussion and suggested ideas for upcoming analyses. Notice that the blog post is a statement of values that did not involve any product changes, while the CoC launch (while also a statement of values) did involve product changes. When the CoC launched, we updated options for comment flagging, including adjusting flagging reasons and allowing all users to flag comments on their own post. What kind of impact can we measure from either of these events? First off, let's walk through a (non-exhaustive) list of quantities that don't exhibit any change over the past year, through both of these events. We do see changes in flagging patterns since August, but that is expected since more people can flag in more ways since the launch of CoC. WOW, not so interesting, right?! This is all largely good news for us, though. These changes/events were not disruptive to how Stack Overflow functions overall. Voting patterns on answers are slightly different. First, let's take a look at the trend for answers that have a positive score. 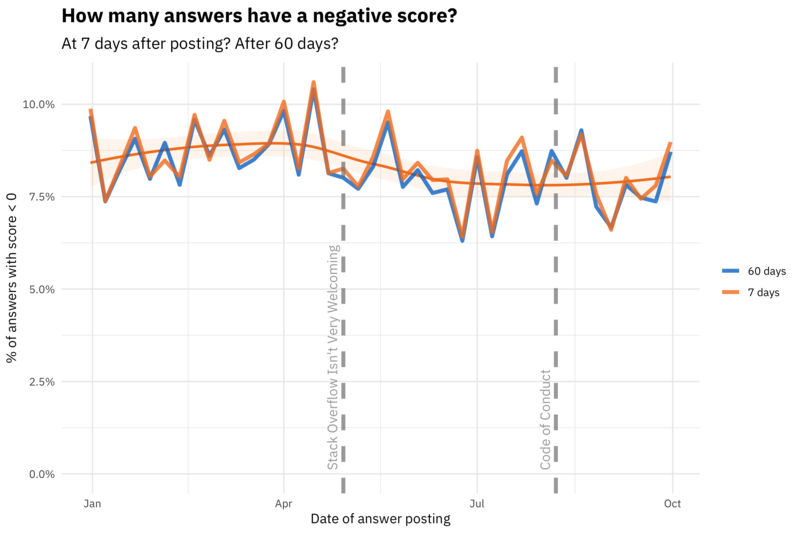 This plot shows, since the beginning of 2018, what proportion of answers have a positive score at 7 days after posting, and at 60 days after posting. The trend is overall mostly flat, indicating no significant change over the year (this is what the plots of the other quantities I mentioned above look like as well). 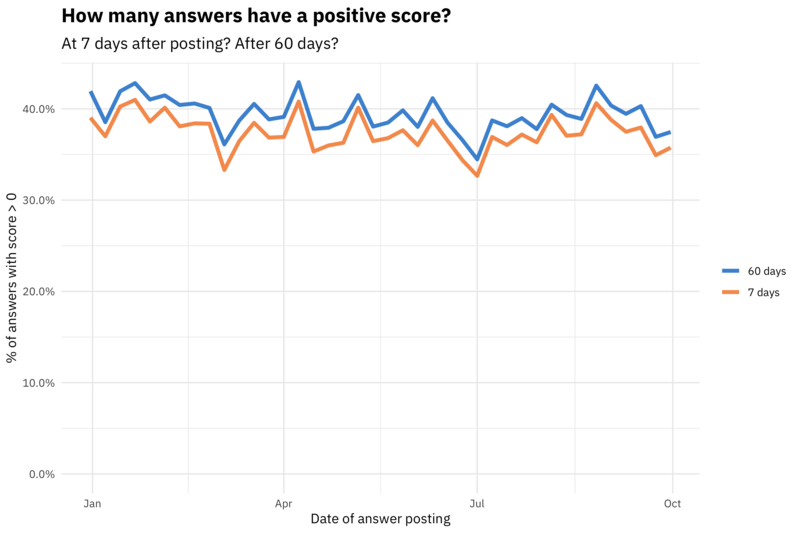 See how the line for 60 days is shifted higher, indicating that more helpful answers are discovered by 60 days than are found by 7 days. Next, let's take a look at answers that have a negative score. There are several differences for the answers that have a negative score, compared to the positive ones. There isn't much difference between 7 days and 60 days after posting, indicating that new unhelpful answers aren't being "discovered" or identified the way new helpful answers are. Also, the overall proportion is much lower; more questions are identified as helpful through a positive score than unhelpful through a negative score by about 4 or 5 times. Why I chose to include this analysis is that we can see some evidence of change with time here. 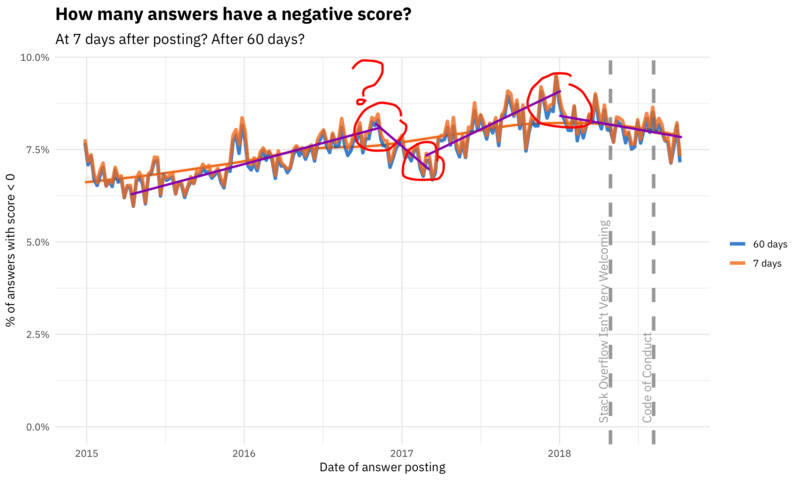 The proportion of answers with a negative score appears lower after Jay's blog post than before. How much lower? Using a t-test, about 1% lower, dropping from about 9% to about 8% (p<<0.05). The p-value says this is unlikely to be a random effect, but let's think about this a little more. I did just tell you that I looked at a lot of different metrics on Stack Overflow, which means we should worry about multiple comparisons. On the other hand, this small shift is robust to subsampling approaches. I think it's likely to be real. So what does a small shift in answer downvoting like this mean? Is it good news or bad news? I am quite confident that opinions will differ, but paired with the lack of change in answer upvoting, question voting, question quality, question closure, etc. I mostly find it interesting that we can probably measure a change in site behavior from a public statement of values alone. These types of metrics are only a few of the ways we are working to understand and quantify the impact of decisions, and we can share more, if there's interest. That's this month's slightly-more-than-bite-size data science time! Thoughts? Do you have topic ideas for future data science explorations? What makes you think that post quality has any relation to the CoC changes in the first place? Voting should hopefully reflect post quality and nothing else. While the CoC changes were almost exclusively about the content of comments, once a question has already been posted. Voting patterns change over time regardless of blogs and CoC. It is well-known among veteran users that SO has a dip in quality whenever schools start or have exams. It seems to me that the negative score graph is mostly a graph over when most schools have vacation. Turns out that's in the summer. A comparison against previous years is obviously needed. Overall, I would like to see more use of the scientific method. Establish a hypothesis, explain why it is a sound one to begin with, then describe why the methods to verify it make sense. Question your own hypothesis and results, apply critical thinking. It gets tiresome when SO keeps publishing what's actually just loose theories as "science". Some of the past articles like for example the "every programming technology older than a few year is in decline" were very poor, because it looked at percentage of total rather than amount of questions asked. Yet people don't question them but keep spreading them over the internet as facts. If you call yourself scientist and these publications science, then prepare to be judged by the quality standards you have set yourself. What is for example the rationale for using a scale with 1.5 months per square in a graph? What does 7/60 days after posting relate to in the graph - does it show the score of the post 7 days after it was posted? As in, what we see for July 1st actually happened June 23th and May 1st? Or is it showing score of what the post posted at July 1st would get in the future? It would seem that the second version is true? A bit confusing. At any rate, I'm having a hard time applying 7/60 days units to the 1.5 month scale, to for example determine if the post time was made 60 days before school exams. The fitted line in the graph over 2018 in the OP doesn't match at all the fitted line in the same data over a 4-year period shown in this answer. Which one should be believe? Something big happened October 2016 through March 2017 that caused a change in voting patterns! And what happened at New Year's Eve last year??? The comment above is obviously tongue-in-cheek, but serves to point out that trends in time data depend very much on interpretation and on the choice of start and stop points. 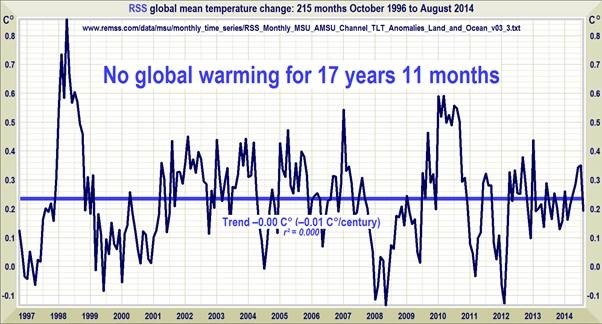 Unless there is a hypothesis to test, such trend lines can be highly misleading. 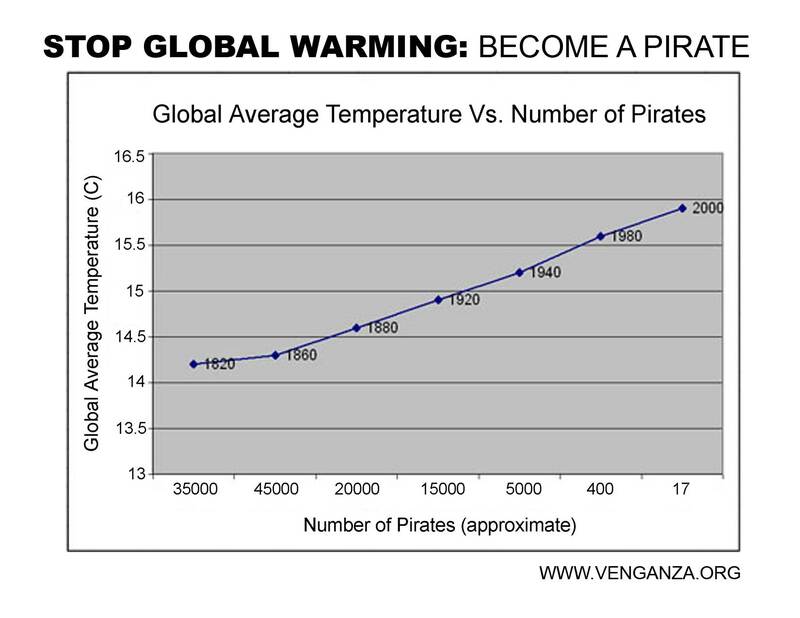 For example you can prove there is no global warming by picking just the right start and stop dates. "One topic many people were particularly interested in hearing about is recent change to improve how welcoming Stack Overflow is"
Not very much for screenreader users. The post listed a series of proportions that were not affected by these changes. These are of course important metrics, but I think they tell only part of the story. The other part would be to look at actual numbers indicating the volume of activity (e.g., number of questions, number of answers, number of new registered users, etc. ), compared to the general growth trend. Presumably, an increase in this growth (above the current trend) would indicate that users are encouraged to be more involved, and a decrease would indicate that the existing userbase found this change unwelcome and dialed back on their activity. Were such numbers looked at? Thanks to all for your comments and discussion. One great point brought up in a couple of ways was how much these proportions vary over longer periods of time, and how surprising a shift like this is. You can see here that there was a long-term trend toward higher values of this proportion of answers with a negative score, and it appears there may have been an inflection point this year. Week-to-week variation is also high. Like I said in my original post, we can't be sure these kinds of changes are not random but they are some of the important metrics of our community for us to understand and notice in the context of decisions we make. Not the answer you're looking for? Browse other questions tagged discussion community-moderation data . Does the current downvote system incentivize improvement of poor questions? Should people who've never asked or answered a question for C be allowed to review C documentation changes?